SAN FRANCISCO – In the largest single fundraiser ever on Facebook, a Silicon Valley couple has raised millions of dollars from hundreds of thousands of people to reunite immigrant parents with their children. As of Sunday, more than 500,000 people had pushed the total over $20 million surpassing all expectations for the Facebook fundraiser set up nearly a week ago by Charlotte and Dave Willner. Their efforts to aid parents forcibly separated from their children at the border struck a raw nerve with the American public, leading to a viral movement on Facebook to fund a nonprofit in Texas. Organizers say donations are streaming in from all over the country and the world. For hours on Wednesday, Dave Willner says the donations were pouring in at a rate of $10,000 a minute. And the fundraising pace shows no signs of slowing as public outrage over the border crisis grows. "My son is safe in my arms. I don't worry about him being taken from me," wrote one donor on the fundraiser's Facebook page. "I donate with a hope and prayer that I never have to." "Sending whatever resources I can and prayers from Japan," wrote another. "Our hearts go out to you, America, during this dark and confusing time." Facebook CEO Mark Zuckerberg joined the cause Tuesday, urging people to contribute even more money to organizations on the front lines in the escalating border crisis. In a Facebook post Tuesday, Zuckerberg took aim at the Trump administration's zero-tolerance policy, calling for donations to organizations such as the Texas Civil Rights Project and RAICES, a Texas nonprofit that helps families with legal advice and translation services. "We need to stop this policy right now," Zuckerberg wrote. President Donald Trump on Wednesday signed an executive order on immigration that he said ends family separations at the border, but insisted his controversial "zero tolerance" policy will continue. All of the proceeds from the Willners' Facebook campaign "reunite an immigrant parent with their child" benefit RAICES. Facebook, which launched fundraisers in 2017, waived fees last fall for nonprofit fundraisers. "It's clearly resonating with a lot of people, and we're just glad we could help," Charlotte Willner told USA TODAY. Reached Monday night, Jenny Hixon of RAICES said the outpouring of support and money have "absolutely blown us away." "Our fundraising infrastructure is spartan. We have one development person on staff, which is me ... and I'm also responsible for overseeing our shelter, volunteer operations, media, community outreach and refugee resettlement," she said. "We're very much a boots on the ground kind of organization." RAICES will share its plans for the funds and let people know how they can get involved on Wednesday. "We've rapidly reached out to other organizations doing complimentary work in Texas to set up a network to cover all the federal courts, develop a database with all separated families and a pro bono referral network to ensure representation for every family," said Hixon, who is the organization's director of outreach, education and development. "This feels outrageously ambitious, but we kind of feel like this is the moment to do the big things." Progressive nonprofits have seen a surge of activism that's been breaking records in activists engaged and money raised since Trump's election, says Brian Young, executive director of Action Network, which provides digital tools to these nonprofits, including the Women's March and RAICES. "But what has happened over the last few days has been more than anything we've seen so far," Young said. "This has broken through in an extraordinary way and will have reverberations for a long time to come." Americans, who were searching for ways to speak up about the Trump administration's zero-tolerance policy, seized on the fundraiser because "this is something that feels very tangible that people can do," says Elizabeth Dale, assistant professor of nonprofit leadership at Seattle University. It's part of a new pattern of "rage giving," among progressives who, after the election, began flooding nonprofits with donations, particularly on women's issues, climate change and immigration, Dale said. Facebook has found its sweet spot giving Americans easy ways to channel their giving, particularly in times of national or international crisis. And the viral nature of the giant social network has fueled successful mega fundraising campaigns such as the ALS Ice Bucket Challenge. "What you have here is a salient issue, you have a platform that makes it easy to give and you have amplification through social media networks often from people to other people who think like them, so you get a lot of people signing on very quickly," Dale said of the Willners' campaign. Charlotte and Dave Willner were early Facebook employees who now work at Pinterest and Airbnb. Alarmed by reports that more than 2,000 children had been separated from their parents, Willner set up the fundraiser Saturday morning. The initial goal was to raise $1,500 to cover the bond fees for one parent so the parent could retrieve his or her child from government custody while waiting for court. But then the fundraiser went viral and private donors began matching funds raised. Late last week, the Department of Homeland Security announced that nearly 2,000 children had been separated from their parents in a six-week period as part of its "zero tolerance" policy. The Trump administration is cracking down on adult immigrants who cross the border illegally by criminally prosecuting them. Children can't be held in criminal detention, so they are being separated from their parents. A seven-minute tape obtained by ProPublica, in which children separated from their parents and held at a detention center wail and call for "Mami" or "Papi," fueled the public outcry Monday. Former first lady Laura Bush and America's other first ladies joined that outcry. "Mrs. Trump hates to see children separated from their families and hopes both sides of the aisle can finally come together to achieve successful immigration reform," Melania Trump's communications director, Stephanie Grisham, told CNN Sunday. "She believes we need to be a country that follows all laws but also a country that governs with heart." Homeland Security Secretary Kirstjen Nielsen defended the Trump administration's policy Monday. "We have to do our job. We will not apologize for doing our job," she said. "This administration has a simple message – If you cross the border illegally, we will prosecute you." Some of the comments on the Facebook fundraiser were supportive of the administration policy. "Perhaps it's time for the parents of these innocent children (to) do the right thing by not putting themselves in this situation," one person wrote. Hixon sees the situation very differently. "The funding we are receiving will save lives. It will keep people from being deported to unsafe countries," she said. 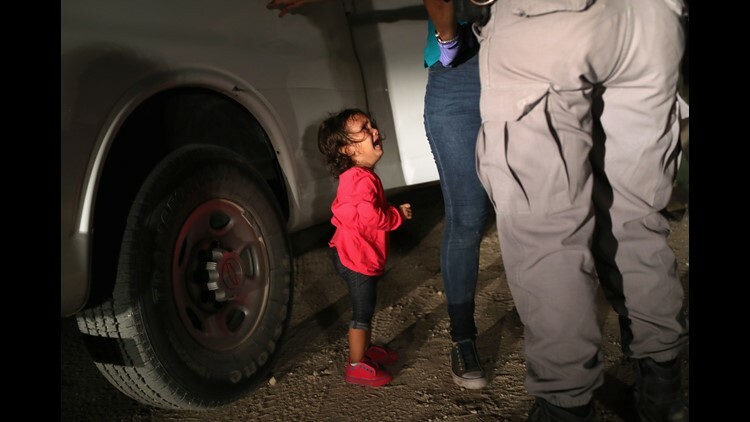 "It speaks to the outrage the cruel policies at the border have provoked. It honestly gives us hope in what has felt like a very dark time." More: Does the Trump administration have a policy of separating families at the border?